Poor little Songbird won't be lonely in Marvel Ultimate Alliance 2, as recent updates reveal that fellow Thunderbolts Norman Osborne AKA The Green Goblin and Venom will be joining the fight. With Marvel Ultimate Alliance 2 focusing on the Civil War storyline from the comics, it makes perfect sense that Norman Osborne make an appearance. After all, this was the storyline that left him one of the most powerful men in the world, though he wasn't exactly prancing about in a goblin suit while he participated. Still, I suppose Norman Osborne in a business suit isn't quite as interesting in a video game setting. Former Scorpion Mac Gargan also teamed with the Thunderbolts during the series. 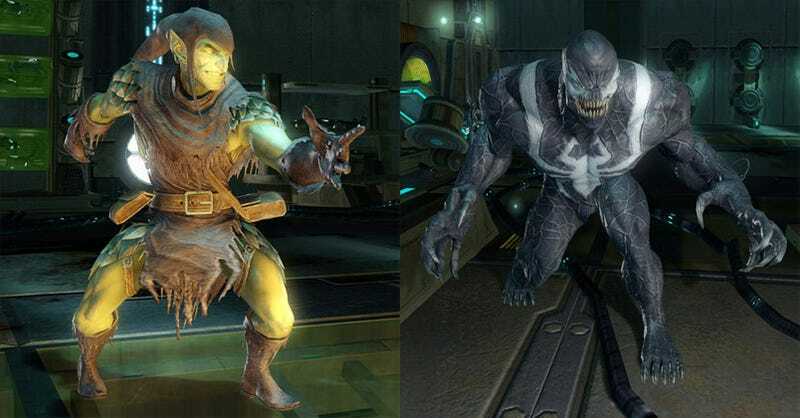 Infused with the Venom symbiote once worn by Eddie Brock, this marks the first time Gargan's take on Spider-Man's greatest foe makes an appearance in a video game. Judging by the exhaustive profiles the pair were given last week on the game's official website, it looks like these two aren't just throwaway characters either. Hit the links below to read up on the anti-hero duo's Marvel Ultimate Alliance 2 appearance.